This post includes two paintings usually attributed to Giorgione in the early stages of his career. The first is the "Trial of Moses" and the second is the "Judgment of Solomon." I include references from three recent catalogs as well as from a recent major study. 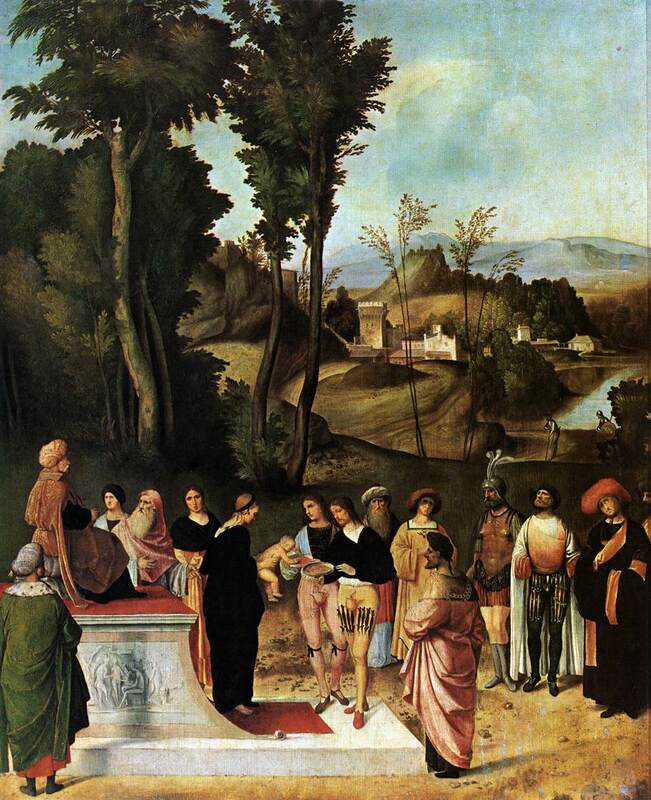 Judgment of Solomon, Oil on panel, 89x72 cm, florence, Uffizi. 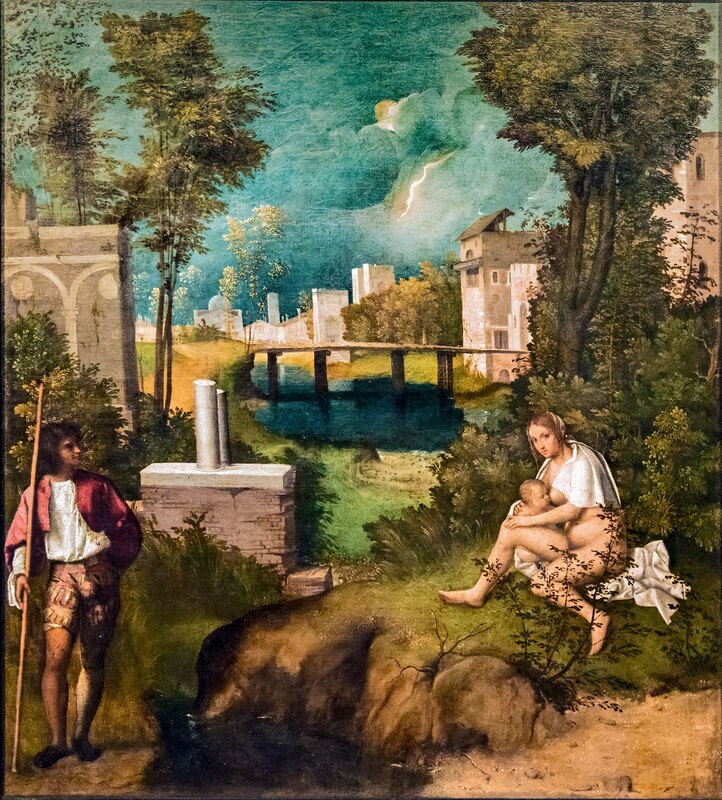 Of all the paintings attributed to the youthful Giorgione, these have the best claim to be considered his earliest works, dating c. 1496, shortly after his apprenticeship with Bellini ended. Unlike some previous scholars, Anderson believed that the works were not the result of a collaboration. scientific investigation of the panels does not reveal any disjunctures that would be proof of joint collaboration. Thus the uneven characterization of the figures could reflect the inexperience of a youthful artist…. In our opinion these paintings are Giorgione’s first authentic landscapes after his initial attempts that were more closely tied to Northern models. Dal Pozzolo's study included the fullest discussion of the two panels. He noted that “an imitation marble decoration featuring plant motifs” on the reverse of each of the panels indicates their original use. What we do know for sure is that at some point in time they were employed as shutters for a piece of furniture (hence to be viewed front and back); no doubt two support pieces—then removed—were originally mounted there, and the holes which are visible at one time probably housed hooks and bolts. Fortunately, although there are questions of attribution and dating, there is no uncertainty or ambiguity about the subject of the two panels. Both are religious or sacred subjects with a judicial theme. The story of the “Judgment of Solomon” is well known from Scripture but the “Trial of Moses” comes from a Jewish legend that became popular in medieval Christianity. Dal Pozzolo’s study includes a full discussion of both stories as well as their artistic representation around 1500. In the “Trial of Moses” the child is put to a test because of a playful prank. He had taken Pharaoh’s hat and thrown it to the ground, an action that could be seen to be full of symbolic significance. As a result he must choose between the plate full of red-hot embers or the one full of gold coins. According to the legend he chose the embers and actually placed one on his tongue, the cause of the speech defect noted in the Book of Exodus. 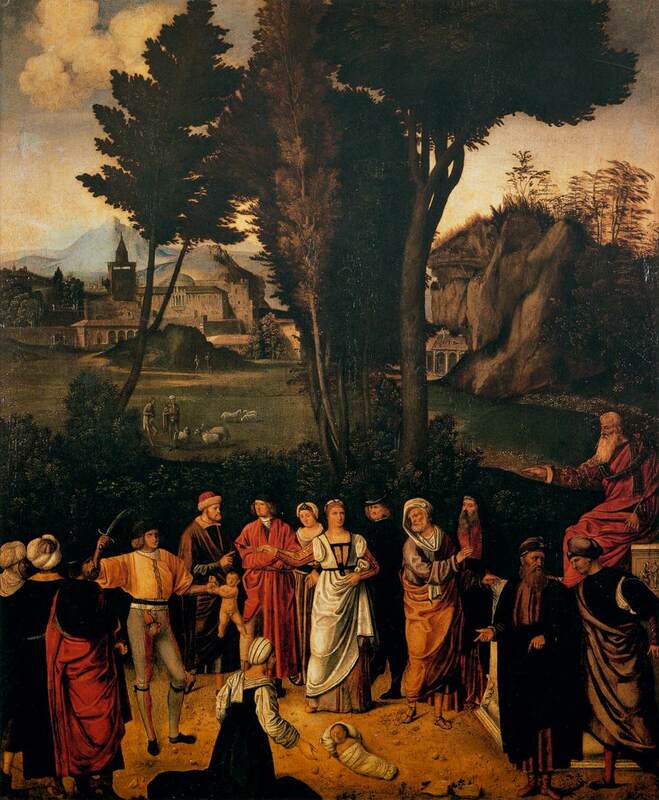 The story of the “Judgment of Solomon” is much more famous and dal Pozzolo gives a very full account. Solomon is on the right sitting on his judgment seat giving the order to cut the child in half. The bad mother stands in the center her gesture agreeing with Solomon’s. Her deceased infant is at her feet. The good mother kneels and surrenders her child in order to save its life. Scholars have pointed out the importance of landscape in both these paintings. Rather than in a palace or a temple the figures in the foreground are out of doors. 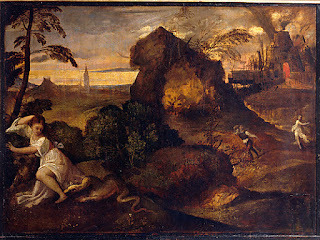 For some reason they have left the city in the background behind, a feature that Giorgione would use in his undisputed works. Also, in these two panels great pains have been taken to dress the young men in contemporary Venetian finery including fashionable codpieces. 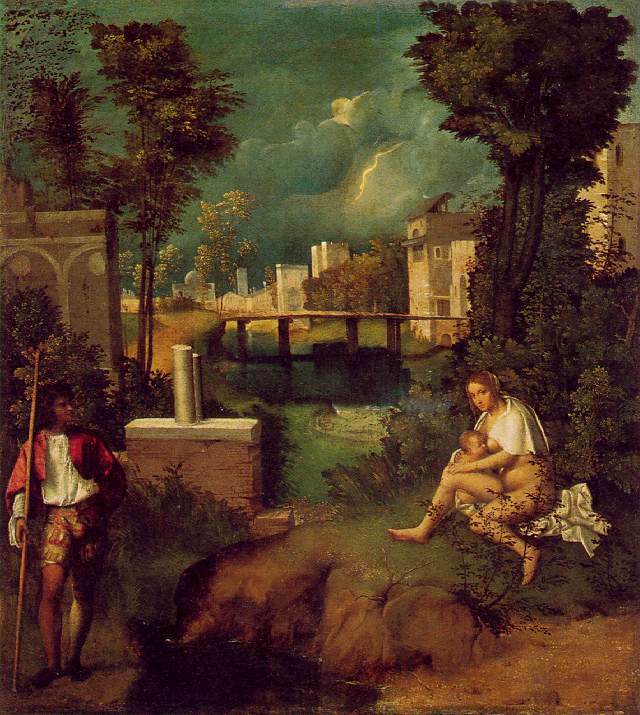 Giorgione most notably used this type of attire for the young man standing guard over the woman in the Tempest. *Anderson, Jaynie: Giorgione, 1997, catalog entry. **Pignatti, Terisio and Pedrocco, Filippo: Giorgione, Rizzoli, NY, 1999, catalog entry. ***Eller, Wolfgang: Giorgione Catalog Raisonne, Petersberg, 2007, catalog entry listed under paintings not attributable to Giorgione. 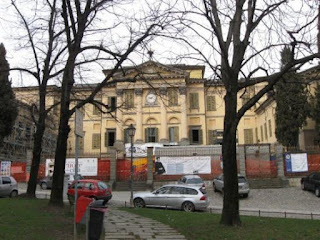 #Dal Pozzolo, Enrico Maria: Giorgione, Milan, 2009, pp. 126-144. My wife and I visited the exhibition on opening day and found it to be a fine but modest offering housed in a relatively small room. Though limited to one room, the room is right in the middle of the Met’s great collection of Renaissance art, and so it is easy to place these paintings in a broader context. The title of the exhibition is a little misleading. There is only one painting, a Pieta, by Giovanni Bellini although many of the others showed his influence. 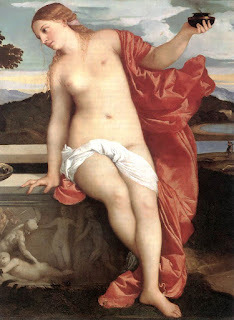 Moreover, the only Titian is a very small version of the story of Orpheus and Euridice. 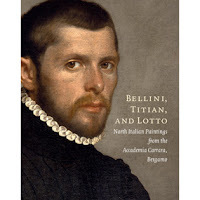 The catalog calls it a very early Titian but admits that the attribution is questionable. 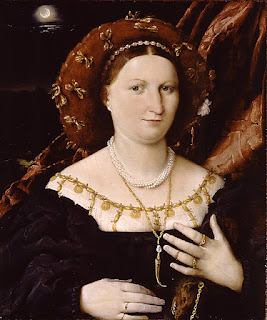 The real star of the show is Lorenzo Lotto with four representative works. The first three are predella pieces separated in the nineteenth century from his magnificent altarpiece that was originally in Bergamo’s church of Saints Stephen and Dominic, but that is now in the church of St. Bartholomew. One piece depicts a story from the life of St. Dominic while another depicts the stoning of St. Stephen. In the middle is an Entombment that, like the others, exhibits the life, emotion, and vivacity that Lotto brought to all of his work. These predella pieces are also full of naturalistic detail including very detailed contemporary costumes. Lotto is also represented by a portrait of Lucina Brembati, a granddame from Bergamo, in all her finery. The exhibition catalog quotes Bernard Berenson’s appraisal of Lotto’s portraits. "They all have the interest of personal confessions. Never before or since has any one brought out on the face more of the inner life." However, the exhibition also serves to introduce the viewer to some lesser-known artists who were working in Northern Italy at the time of Bellini, Giorgione, and Titian. Vincenzo Foppa is represented by the “The Three Crosses,” a Crucifixion scene of the mid fifteenth century that demonstrates a remarkable use of perspective. There are two religious works by the Milanese painter styled Bergonone including a very striking nursing Madonna from around 1485. Also represented are Bartolomeo Montagna, Giovanni Cariani, Moretto da Brescia, Andrea Previtali, and Giovanni Battista Moroni. Most of their contributions are sacred subjects but there are also a few outstanding portraits. All the paintings are on loan from Bergamo’s Accademia Carrara currently in the midst of renovations that will be completed in 2013. In the catalog, M. Cristina Rodeschini, the Head of the Accademia Carrara, provided an overview of the storied history of the collection including the contribution of Giovanni Morelli, one of the great figures in the nineteenth century revival of interest in the art of the Renaissance. Andrea Bayer, who participated with Dr. Rodeschini in putting the exhibition together, also contributed essays on the history of the Museum, as well as on the individual paintings in the Met exhibition. Her introduction should make anyone want to visit Bergamo and the Accademia Carrara after the completion of the renovation in 2013. My wife and I first saw Titian’s Sacred and Profane Love on a visit to the famed Borghese Gallery in Rome in the spring of 2010. We were in Rome for a few days at the end of a journey that had begun in Venice where I delivered my paper on Giorgione’s Tempest at the annual meeting of the Renaissance Society of America. After the conference we visited Florence and Orvieto and wound up in Rome to complete our journey. However, once in Rome we discovered that we were among the multitude stranded there because an eruption of a volcano in Iceland had shut down most air travel from Europe. It was a nerve-wracking experience but we were in a lovely hotel not far from the Spanish Steps and the Pantheon. We had no choice but to enjoy a few extra days in Rome. 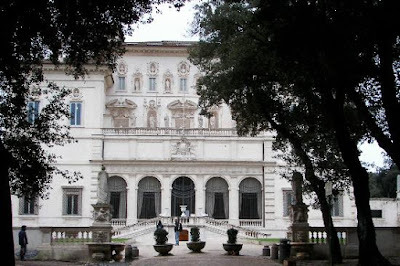 So one day my wife suggested we visit the Borghese, a site that due to my ignorance we had never visited before. The Villa Borghese is located in a huge beautiful park right across the street from the fashionable Via Veneto. Even though a sign at the door said sold out, we entered and had no trouble gaining admission. The Villa was built in the early years of the seventeenth century by Cardinal Scipione Borghese…and was bought, with its magnificent collection of pictures, and beautiful gardens and parks, by the Italian government for 144000 lira, much less than its real value, in 1901. Fifty years later Giorgina Masson gave this overview. Walking through the park was a beautiful experience but we had come to see the collection within the Gallery. We were not disappointed. The collection of statuary on the first floor was incredible including famous works by Bernini and Canova. However, it was the second floor that blew us away. I share the feelings of Edward Hutton expressed over a 100 years ago. 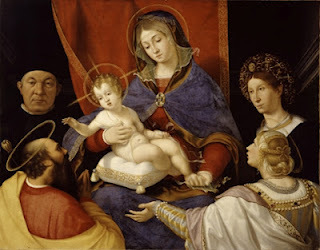 But it is really the Gallery of Pictures which calls for our wonder and admiration, since it is, perhaps, the finest private collection of the Italian masterpieces of the sixteenth century anywhere to be found…. The Sacred and Porfane Love, painted about 1512 for Niccolo Aurelio, Grand Chancellor of Venice, is the highest achievement of Titian’s art at the end of his Giorgionesque period. It has been in this collection since 1613, when it was called…’Beauty unadorned and Beauty adorned.’ In fact, the name it now bears, which has so puzzled the world, does not occur till the end of the eighteenth century, when it seems to have been given it by the Germans. For us, at least, it can have no authority, the subject of the picture being merely a moment of beauty,--a moment gone, but for Titian’s genius, while we try to apprehend, in the golden summer heat, under the trees by a fountain of water…. No photograph or digital image can do justice to the Sacred and Profane Love. It is over nine feet long and seems to take up almost an entire wall in one of the largest rooms. I think that Hutton was right on when he described the subject of the painting as a “moment of beauty.” That is certainly the first impression when looking at the two beautiful female figures in the equally beautiful landscape. Titian’s coloration is also overwhelming. However, I distinctly recall turning to my wife and saying, “It’s Mary Magdalen.” Why? I still don’t know. Nevertheless, after we finally got home, I began to think more and more of the iconographic symbols in the painting, and to do a little research on the Magdalen. I discovered that as in the case of the Tempest, there was no agreement among scholars about the subject of the famous painting. 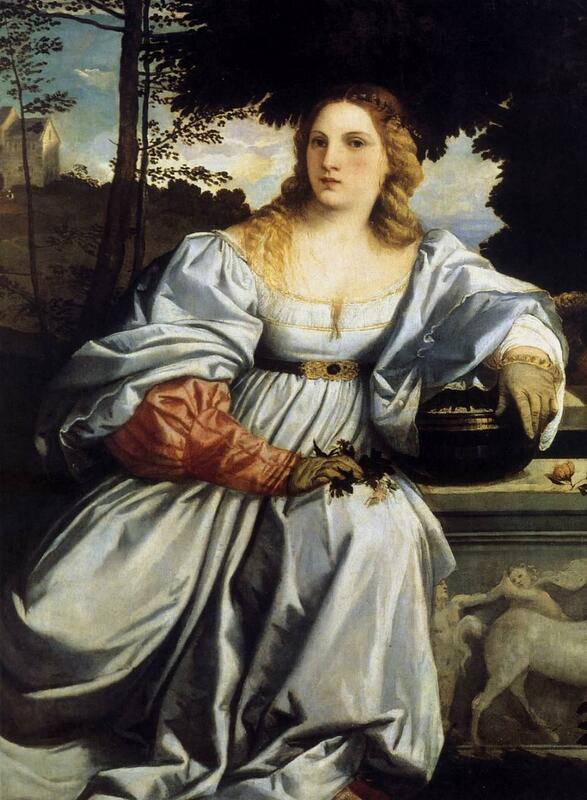 Moreover, recent scholarly studies of Mary Magdalen in history and art provided much material for a Magdalen interpretation. It took a few months to do the research and to write a first draft that was very kindly reviewed by some art history blogger friends. Eventually, I put the paper on my website and guest posted a condensed version on the popular art history blog, Three Pipe Problem. *** Earlier this year I presented the paper in New Orleans at the annual meeting of the South Central Renaissance conference. Attempts to publish the paper in a scholarly journal have so far been unsuccessful. Sometimes I worry that interpreting beautiful paintings like the Tempest and the Sacred and Profane Love as “sacred” or “religious” subjects might lessen the reverence that these paintings have enjoyed in both the scholarly world and in the popular imagination. For years people have loved these paintings. Part of the allure has been the mystery and enigma that has always surrounded them. Moreover, in today’s secular society would a “sacred” subject turn people off? I hope not. To me it is the mark of genius to be able to produce beauty that will be admired even by those who don’t see the paintings in the same way that devout contemporary Venetians might have. I know that the Sacred and Profane Love was not originally meant to be hung in the Borghese Gallery but seeing it there in that magnificent setting will always be an unforgettable experience. In 1909 a young Edward Hutton summed up the experience and fifty years later in the seventh edition of his “Rome” his opinion of the Borghese was the same. *Edward Hutton, “Rome”, New York, 1909, pp. 330-333. **Giorgina Masson, “Italian Villas and Palaces,” London, 1966, pp. 248-9. *** Note, 5/5/2017: Three Pipe Problem no longer exists due to the unfortunate and untimely death of its creator, Hasan Nyazi.